Check Rates & Availability at BEST WESTERN PLUS Gadsden Hotel & Suites! Your Best Western Plus Gadsden Hotel & Suites has everything you need for a great getaway, including a superior location, service and quality. Customer service is the key at our Gadsden hotel, and our staff wont rest until youre completely comfortable. Were close to the Talladega Race (NASCAR ) and are happy to host groups of fans and drivers in town for the races. Our location from the Interstate cant be beat, making it easy for vacationers and business travelers to get where theyre going, whether its a big meeting or family reunion. Gadsden, Alabama hotels are known for hospitality, and we take making you feel welcome above and beyond your expectations. The starting point for the Worlds Largest Yard Sale is in the neighborhood, and we regularly welcome bargain hunters and those looking for treasures. No matter what brings you to this part of Alabama, rest assured that a warm welcome is waiting for you. Hotels in Gadsden are surrounded by top-notch attractions, dining and shopping. Robert Trent Jones Golf is a popular destination for many who want to work on their swing or simply spend the day touring the 18 holes. A sport complex five miles away always has something exciting happening, and catching a game is a great kickoff to a vacation. Our Gadsden hotel is located off I-59, and there are many fishing tournaments throughout the year. Your river-front property is the perfect romantic escape, too. However, youll still be close to town, which is a must for business travelers. Employees of NASCAR , Fehrer Automotive, Decatur Plastics and KTH and YMA are frequent guests. Service men and women with the two Army Guard stations also favor the comfort of our Gadsden hotel. Reserve a room at the Best Western Plus Gadsden Hotel & Suites today for a great rate! Welcome to Best Western. From: Interstate 59 North. Take Exit 181. From northbound ramp, go left at red light, cross bridge and then take second right at Enterprise Drive. The Best Western Plus Gadsden Hotel & Suites is across from Walmart . From: Interstate 59 South. Take Exit 181. From southbound ramp, go left at red light and then take first right at Enterprise Drive. 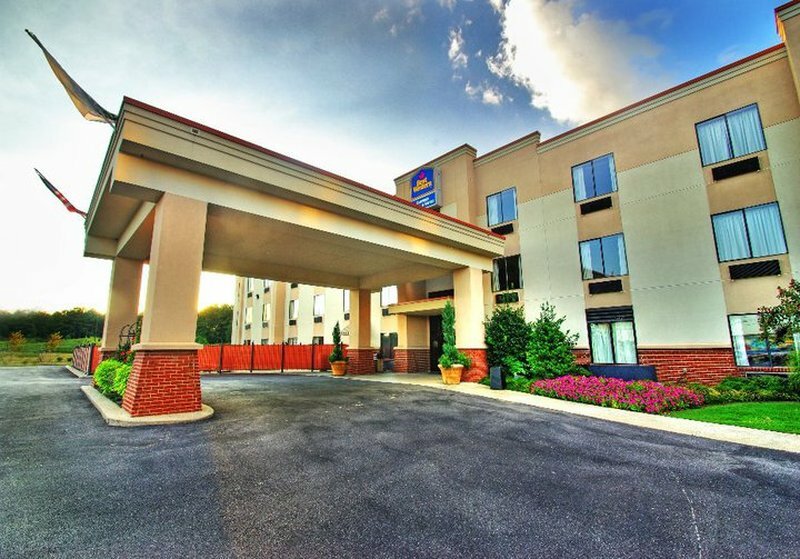 The Best Western Plus Gadsden Hotel & Suites is across from Walmart . 0.50 mile(s) from Los Arcos, full service, Mexican, open for: lunch, dinner. Great Mexican dishes, and a friendly inviting staff! 5.00 mile(s) from Chili's , full service, American, open for: lunch, dinner. 11:00 p.m. to 11:00 p.m. Monday through Thursday. 11:00 a.m. to Midnight Friday and Saturday. 11:00 a.m. to 10:00 p.m. Sunday. 5.00 mile(s) from Applebee's , full service, American, open for: lunch, dinner. 11:00 a.m. to 11:00 p.m. Monday through Saturday. 11:00 a.m. to 10:00 p.m. Sunday. 5.00 mile(s) from Red Lobster , full service, Seafood, open for: lunch, dinner. 11:00 a.m. to 10:00 p.m. Sunday through Thursday, 11:00 a.m. to 11:00 p.m. Friday and Saturday.